Hello friend! I’ve been working on a secret present to give to you and the rest of my amazing community and in the course of my research I discovered this AMAZING fermented drink, switchel, that is a spectacular alternative to kombucha or sugary electrolyte drinks. I’m actually sipping on the glass I poured to take the cover photo right now! This tangy, refreshing beverage has it’s roots in 17th century Caribbean culture and was brought over to North America where it was enjoyed by farmer’s during their long, hot days cutting hay, hence its nickname of Haymaker’s Punch. 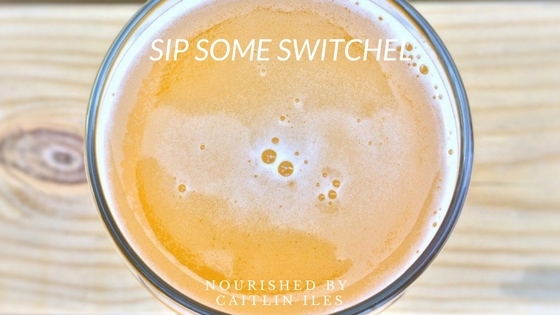 The actual ingredients and process of making switchel is ridiculously easy so it is perfect for people who want a health-promoting alternative to those sugary-sweet electrolyte replenishing beverages. It has many impressive health benefits even though it has a relatively small ingredient list. This potent spice has many incredibly healing benefits. It can be an excellent modulator of inflammation in the body and through that role is an incredibly effective pain reliever, even more so than some OTC painkillers according to certain studies. It has also been shown in studies to reduce age-related oxidant markers, which is basically a fancy way of saying it has potent anti-oxidant properties that can help us look young and fabulous as we enter our golden years. Ginger is also an old standby for helping banish nausea and motion-sickness, so having this drink on hand for when we’re feeling sick can give us a quick way to calm our angry tummies. Finally, there is a lot of interest in studying the anti-cancer effects of ginger and its active constituents such as gingerols and shogaols. Scientists believe that ginger exerts its anti-cancer benefits by inducing cellular apoptosis (death), decreasing proliferation, causing cell-cycle arrest, and suppressing activator protein signaling pathways. Those are some pretty impressive health benefits in addition to tasting freakin’ awesome, so drink up! 1. When bought in the unpasteurized form with the mother (it’s similar to the SCOBY) it can help improve digestion and, uh, keep things moving south in a timely manner thanks to its amazing strains of probiotic bacteria. 2. If you have a hard time digesting certain foods or suffer from heartburn, you can try taking a Tbsp. about 15-20 minutes before meals (in water if you don’t want the burn, but I just shoot it like a champ) to see if it helps. 3. It makes a great skin toner! Just add 1 part ACV to 10 parts water and use before bed. I had a monster breakout last weekend and it helped clear me up in a jiffy! 4. Certain studies have shown that consuming ACV with a meal can help balance blood sugar, due to the acetic acid content. Managing blood sugar is crucial for balancing energy and keeping inflammation in check. 5. It is rich in different minerals such as potassium and calcium, which can help balance our electrolytes. 6. Its various compounds function as liver and lymphatic tonics, which helps with proper detoxification in the body, leaving us with less inflammation, clearer skin, and brighter eyes! This sweetener is a great alternative to cane sugar because it contains trace minerals that can help with the above mentioned electrolyte balance. We need to have proper electrolyte ratios in order to regulate our heartbeat, use our muscles, and catalyze many different metabolic functions throughout our bodies. Intense and sweaty exercise, poor diet, illness, and some medications can affect our electrolyte balance, so swig on some switchel to help replenish your stores! Raw, unpasteurized honey (not the stuff that comes in the shape of a bear or bee, typically) has tons of great health benefits. It is a form of sugar, so you don’t want to go too crazy with it, but including small-moderate amounts in your diet can have antimicrobial, antiviral, and antifungal effects. It can also have antioxidant properties and helps strengthen your immune system, which is a fantastic benefit for cold and flu season. Specific enzymes, such as diastase and invertase, are also found in honey and can help improve digestion and assimilation. I suggest switching between honey and maple syrup in order to receive the benefits of both sweeteners. Honey is definitely my favourite sweetener because it’s delicious and comes in all kinds of different flavours depending on what flowers the bees were pollinating. Look for raw or unpasteurized on the label, or go local! Most farmers’ markets have at least one or two vendors selling their own awesome honey products. This recipe makes the perfect cooling drink for hot summer days. You can jazz it up with fresh mint, lemon, lime, or fresh berries after it’s been fermented. Enjoy! 1 tsp. ground or 3 tsp. fresh grated ginger feel free to add more to kick it up! Whisk together all ingredients in a large bowl. Transfer to a sealable 1 litre jar. I like pop top bottles. Drink immediately or set on the counter for 2-3 days and then drink at will! If using fresh ginger you will want to strain it before drinking. Bonus Tips: I love adding some fresh mint and/or a squeeze of lemon to really jazz this up. You can also use sparkling water if you want a fizzier option. Well friend, that’s a brand-new, super easy and delicious healing fermented drink for you to add to your repertoire if the thought of making your own kombucha seems a little too labour intensive. If you’re looking for more support on your health journey then make sure you download my FREE 7-Day Healthy Detox Meal Plan to get lots of recipes, a handy shopping list, and an outline of delicious foods to eat to help boost energy! Can I waterbath jars of it? 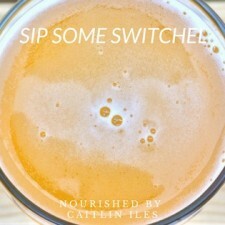 You shouldn’t need to water bath the switchel. So long as your jars are clean it should last in the fridge/cool room unopened for quite some time. If you leave it at room temp, the sugar will continue to be digested so it will become more sour as time goes on.